Truer words were never spoken. We joke about the Doha Pearl, but clearly the kidney stones affected Simone today. She sat down her vault and fell off the beam. Yet, despite her mistakes, Simone not only won, but she won by her largest margin of victory ever in the world all around competition! For those who don’t understand how Simone can fall and still win, every score has two parts. A difficulty score and an execution score. While Simone received lower than usual execution scores, her routines are so far and above the other women in difficulty that she can still survive to win. In other words, the other women need to step it up if they ever want to have a chance to beat Simone. Mai Murakami won the Silver after finishing out of the all around world podium by 0.1 last year. 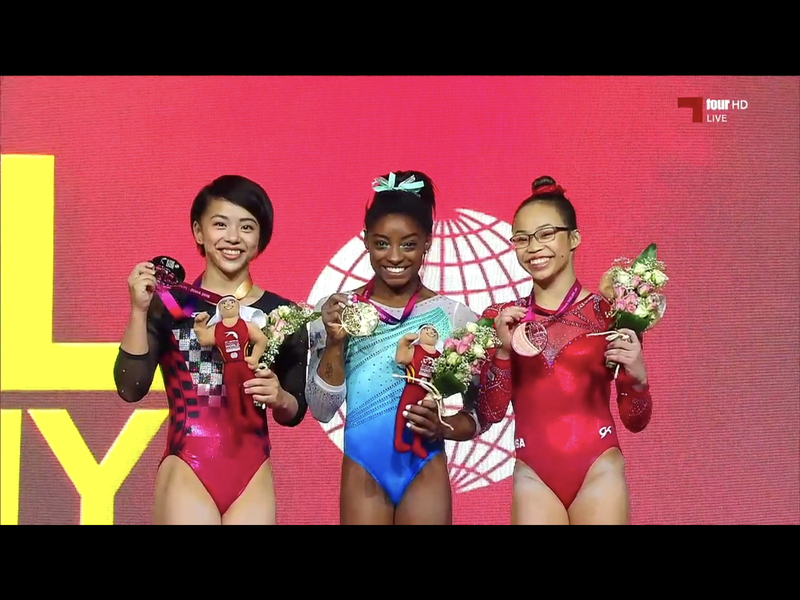 Morgan Hurd, last year’s World All Around champion, won the bronze. This meet was so exciting. With Simone off her game, it really was a contest to see whether the theory that Simone could fall several times and still win was actually true. Turns out it was. But, check out the standings. Look how close it was between second and sixth place! The next year and a half is going to be insane. With some folks qualifying through World cups instead of Olympic trials/selections, the 2020 Olympics could prove to be anyone’s game. Event finals over the next few days. Let’s hope Simone can get healthy soon. Congrats to Simone, Mai, and Morgan!